The larger the venturi diameter is and the lower the pressure drop will be than those with a lower venturi diameter and with equal characteristics with consequently power increase. The smaller the diameter is, the more the flow speed will increase improving the power output. 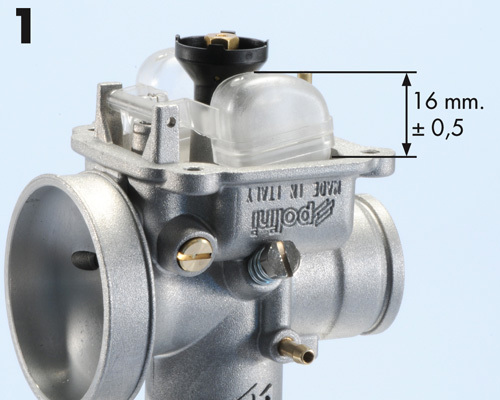 The Polini CP carburetor has slightly different dimensions than the more common carburetors. At the time of purchase it is therefore necessary to consider what adjustments are necessary for a proper assembly. The most important adjustments are the flanges to fit the filter and the curves to connect the throttle cable and choke. Once you have assembled the carburetor it must not hit or get in touch with other engine parts or bikes parts (except for the intake manifold or the filter to which must be connected). 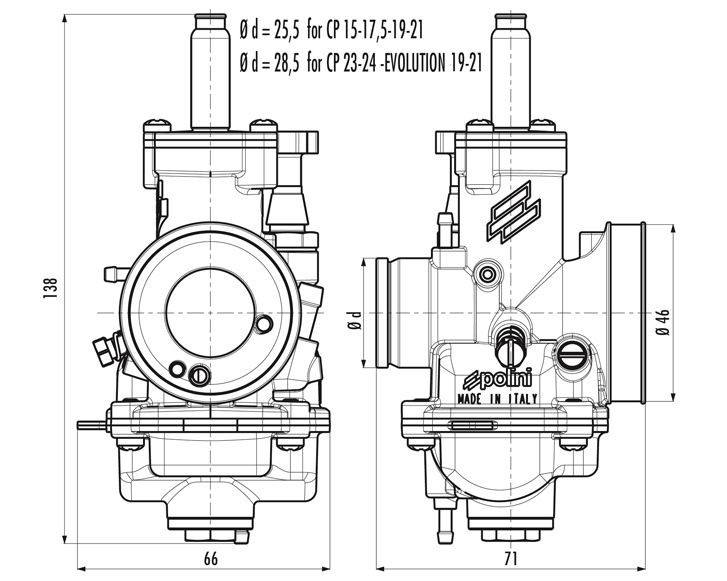 The Polini CP carburetor is sold with standard calibration that has been set-up during the tests on the most famous standard motorcycles and scooter or equipped with power unit but whose engines do not exceed 12.000 rpm. For different settings see the proper section. If your engine exceeds 12.000 rpm and it is equipped with racing products we advise you to carefully read paragraph 11 “COMPETITION”. Polini CP carburetor is of needle type. The fuel arriving from the tank is held inside at a constant level thanks to the floating needle mechanism. 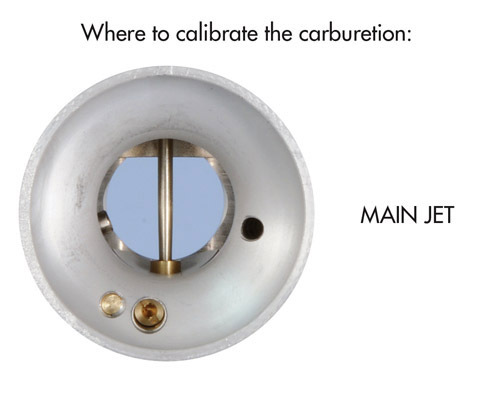 The fuel level in the bowl that arrives to the jets during its working remains constant and therefore so it is the gap that the fuel must pass to get into the spray nozzle. 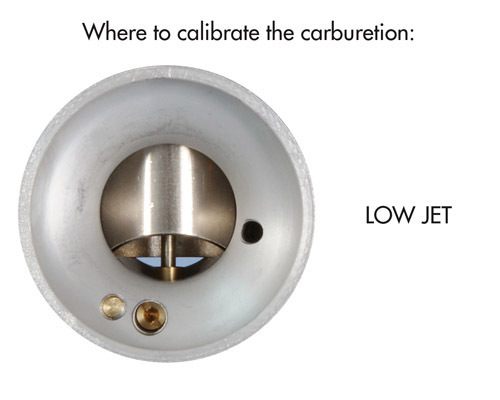 The fuel level in the bowl is therefore a calibration element of the carburetor, since when it changes consequently the signal on the carburetor intake nozzles changes and therefore affects the mixture ratio. • if the diameter is too small you risk to get a poor carburation because the bowl may empty very fast than the needle can make the fuel pass through, with the serious risk of damaging the engine. • The diameter of the POLINI CP carburetor needle housing has been studied to avoid this problem as the hole diameter is oversized. It is an adjusting element that determines the area actually available for the flow passage. 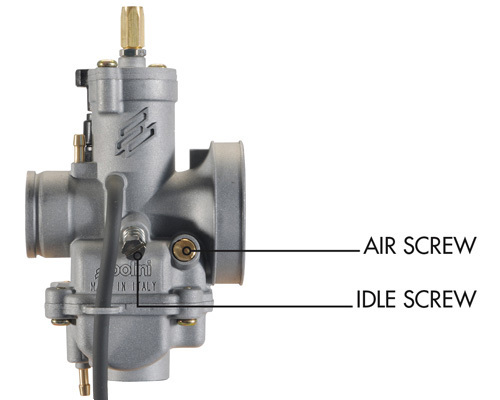 It’s a cylindrical valve that slides across the venturi in an appropriate housing obtained in the carburetor. To eliminate the phenomena of wear or “sticking” of the throttle valve, the same and the elements that surround it are subjected to material hardening treatment. 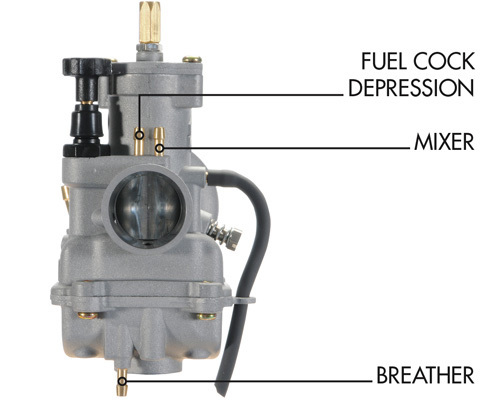 The working principles of all the carburetors refers to the same physical principle. The principle is that the fuel responds to a vacuum signal generated by the induction action of the engine. When the gas valve is closed, or nearly so, the depression that insists on the main spray nozzle is not sufficient to draw fuel from the bowl. It is for this reason that the carburetor has a second supply circuit that operates with this kind of conditions (at IDLE) allowing the engine to operate normally that otherwise would stop running. The idle circuit is equipped with a supply port placed immediately downstream of the throttle valve, at a point such that once the valve is closed, it experiences strong vacuum conditions and therefore is in the best condition to supply fuel from the bowl. It is equipped with its own jet (idling) whose choice is very important not only to work in idle conditions but also to get the best engine response during the first opening of the throttle valve, which subsequently will characterize the next progression. If the selected idle jet is too big, the engine may tend to stall and responds slowly to the throttle. If, on the contrary, the jet is too small, the engine responds better to the throttle but when the throttle is closed, the speed remains high for few seconds before settling down to idle. The fuel supplied by the idle circuit is mixed with a small quantity of air. 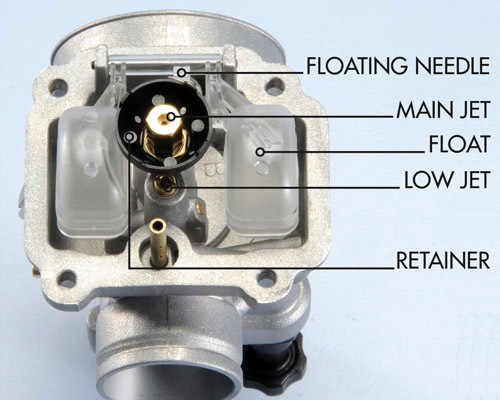 The quantity of air is minimal when the idle circuit is working but it becomes more relevant for the progression circuit when the throttle valve is lifted. The idle set up is made by acting on the air screw. To get an enrichment you need to screw the air screw (close the air intake); otherwise to lean the carburation you need to unscrew it. The best setting is achieved with the air screw 1-1.5 turn open from completely closed position. When the throttle valve is slightly raised the needle reduces the space for the fuel passage and so the depression increases but the output remains low and consequently the mixture ratio remains fixed. When you have a large throttle opening the needle is in the atomizer and it increases the fuel supply space; then, while depression is decreasing, the mixture ratio is optimal thanks to the increase of fuel passage area. The engine is able to operate at all throttle openings.The needle is attached to the throttle valve with an elastic clip which binds to one of the notches on the end of the stem. The adjustment of the needle system can be made by acting on the needle itself. In particular, if you need to lean the mixture you must lower the needle (by moving the clip above) while if you have a fuel mixture which is too rich you must lift the needle (by moving the clip below). 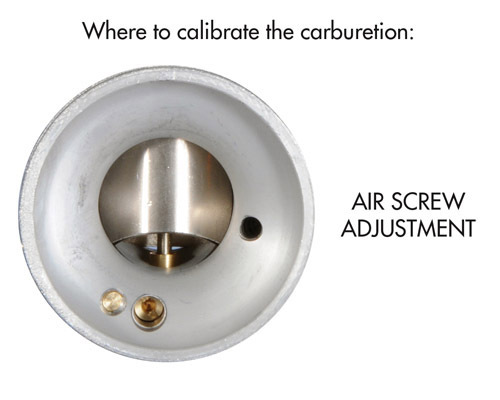 Even the conical degree and the length of the conical part of the needle are important parameters for the carburetion adjustment because they directly affect the overall engine response. 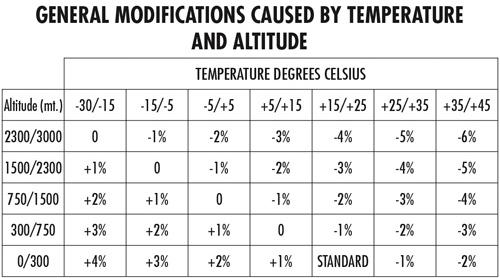 When it is not possible to correctly adjust the carburetor acting on these parameters you will need to replace the needle with another of different features. The adjustment of the carburetion can be done by modifying the jets and/or changing the position and the type of the conical needle but you can also act on the atomizer. 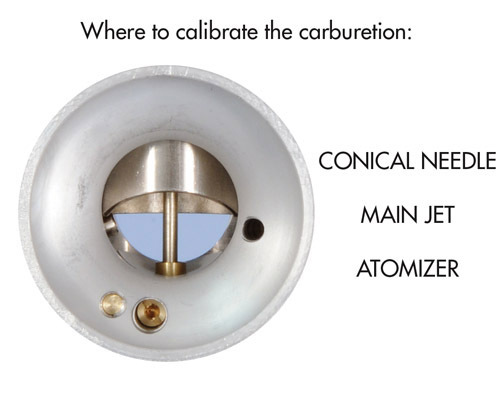 The atomizer end parts which is very close to the venturi has a bush of calibrated diameter, available in different sizes. By increasing the atomizer’s diameter, the mixture is enriched. 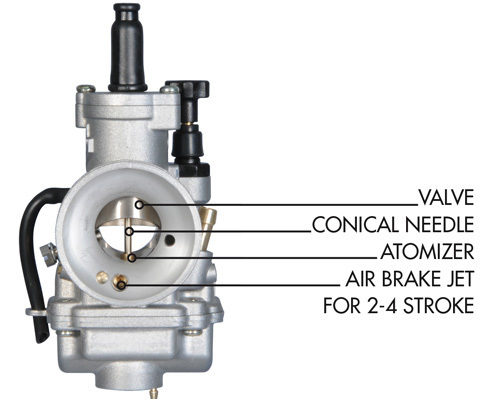 The atomizer is a tube that connects the main jet to the venturi and it is called “two-stroke type” when it doesn’t have any hole. Otherwise if it has a series of holes along its entire length it is called “four-stroke type”. (Attention: to call the atomizers “2 or 4 stroke” is popular but technically incorrect because you can safely use atomizers with holes for the 2 stroke too. I.e the Minibikes have atomizers with “4 stroke” type holes). Its working is very easy: due to the depression in the venturi then, from the atomizer tube the liquid fuel is drawn, metered by the main jet and by the conical needle, while a certain airflow comes from the channel. Air and fuel mix together and the result is a pulverized spray sucked by the engine. To intervene in this process, in addition to the atomizer hole, there are the air channel diameter, the height of the part of the atomizer protruding into the chamber and the height of the step located in the nozzle. In addition to the atomizer’s hole diameter, the variables are therefore the diameter of the air channel, the height of the atomizer’s side that protrudes in the chamber and the “step” of the delivery nozzle. The “four stroke” type produces leaner mixture and more controlled; in fact since it is equipped with a series of holes the emulsion is done inside the tube, before the mixture reaches the nozzle in the venture. Obviously the arrangement of the holes and their diameter influences the delivery. Holes machined in the lower part of the atomizer are bathed in the fuel of the bowl so, by increasing the numbers of holes the flow of fuel increases and goes to emulsify itself with the air. The holes in the upper part of the atomizer are exposed to air and by increasing them you obtain weaker carburation at low rpm. 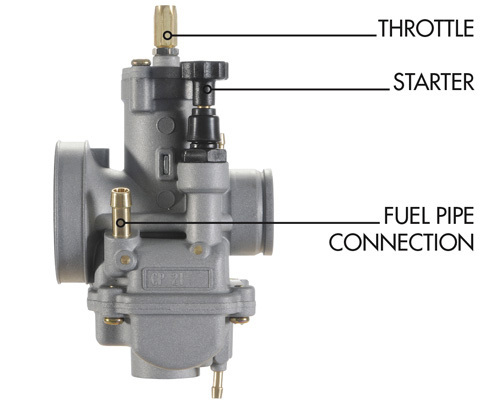 The POLINI CP carburetor can be adjusted so that it works with both the types, 2 or 4 stroke, changing the brake air jet. Open air brake jet: the atomizer holes work and make the engine weaker. It’s one of the most important elements of the carburetor’s adjustment, because it calibrates the fuel delivered by the main system. To begin you have to try some jets, and it is good to start with a bigger jet to prevent the engine damage with a too poor fuel mixture that would lead to a seizure or piston drilling. 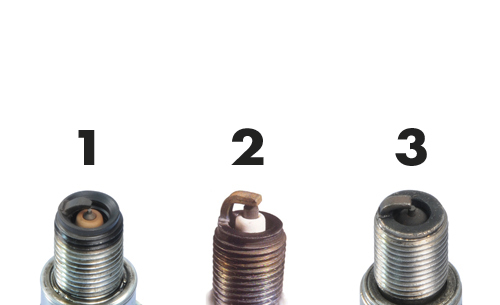 Proceed by trial and error: after having driven a straight at full throttle at the highest rpm check the spark plug color (see spark plug color table). When you find the proper jet it is important to increase the size of a few points as a precaution because a mixture weakening could have passed caused by temperature lowering or by an increase of the environmental pressure. If the carburetor is fitted on racing engines that exceed 12000 rpm, please carefully read the following instructions. The Polini CP carburetor is lighter than other carburetors available on the market and under certain conditions it may cause fuel emulsion problems. Air bubbles are sucked into the main jet casing very serious problems to the engine that becomes poor despite having a big or correct jet; the engine begins to detonate up to its break.